After a year of fighting Chryslers decision to cast aside his dealership, Jim Bickford expected to be back running Westminster Dodge, the only Chrysler franchise in Boston. But Mr. Bickford is still not sure whether he will be able to return to selling new cars and trucks. Chrysler is offering to bring Westminster Dodge back aboard only if it meets a list of restrictions, undertakes immediate renovations  and if no nearby dealer objects. We won our case, lets move on, said Mr. Bickford, whose father began working at the dealership more than 50 years ago and bought it in 1977. Dozens of Chrysler dealers who have won arbitration rulings against the carmaker are back in the hands of the same people who wanted them gone in the first place. And many of the dealers say Chrysler is not only refusing to extend a welcoming hand, but is imposing requirements more rigorous than many existing dealers must follow. Chrysler says it is complying with the law passed in December by Congress that set up the arbitration process. A spokesman, Mike Palese, said the company could subject former dealers to the same terms imposed on first-time applicants because Chrysler was a new company after emerging last year from government-aided bankruptcy. In addition to the 32 dealers who have won in arbitration, out of 789 cut over all, Chrysler in March offered 50 former dealers in rural areas the opportunity to come back. Twenty-one of them have accepted the offer, Mr. Palese said. Mr. Palese said some of the dealers who had won in arbitration also accepted Chryslers terms, but he declined to say how many. He said Chrysler was in talks with many of the dealers and was very open to having a substantive discussion if a dealer could present a compelling reason to negotiate the terms being offered. 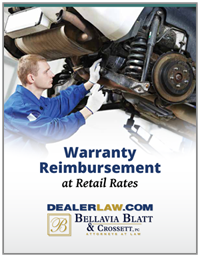 Among the terms many returning dealers consider most unreasonable are requirements that their showroom be enlarged and updated to meet Chryslers standards for selling all four brands, even if they sold only one or two, and a provision that lets Chrysler install a competing dealer nearby if it wishes. A big question is why dealers would fight so hard to restore ties with a company that publicly tossed them aside and whose prospects remain uncertain. Chryslers retail sales, which exclude bulk deliveries to businesses and governments, are down more than 25 percent since its bankruptcy, while other carmakers have increased retail sales. In fact, some dealers wanted nothing more to do with Chrysler and instead sought compensation for losing their franchise. Of the 418 former dealers who filed for arbitration against Chrysler, 150 settled privately, Mr. Palese said. The agreements are confidential, but people with direct knowledge of the terms said settlements averaged about $500,000. Mr. Palese said 130 cases had been withdrawn or dismissed, and 108 had gone through the full arbitration process, with Chrysler prevailing in 76. Some of the dealers who challenged their termination said they had devoted their entire careers to selling Chrysler vehicles and remained loyal to the company. For others, it was largely about trying to get back what they thought was rightfully theirs, as well as a feeling of obligation toward their employees, some of whom were laid off. Pat Fitzgibbon, who won a ruling to regain his Dodge franchise in South Holland, Ill., a Chicago suburb, said he saw great potential for Chrysler as it focused on developing improved models. Mr. Fitzgibbon said he expected that rebuilding his customer base would require a monumental effort, just as fighting the companys decision to get rid of his dealership did. As the dealers struggle to undo their terminations, a government audit released in July questioned whether such a broad, rapid cutback was even necessary. The report, by the special inspector general of the Troubled Asset Relief Program at the Treasury Department, said the Chrysler closures and the 2,064 closures at General Motors might not have contributed to making either company more viable, and possibly hurt the economy more than they helped. Chrysler disagreed. Mr. Palese said Chrysler remained confident that its smaller, better-focused, more optimized dealer network would lead to higher sales. Chryslers sales in the United States during the last 12 months declined 7 percent, while overall industry sales were up 8 percent. Jack Fitzgerald, who lost five G.M. dealerships and five Chrysler dealerships last year, said Chrysler had not learned the G.M. lesson: that fewer dealers means fewer sales. In March, G.M. offered reinstatement to 702 dealers, and its dealers have consistently praised the automaker as handling the process more humanely than Chrysler. This week, G.M. said it settled with 408 dealers, and only 62 of the 1,176 dealers who filed for arbitration actually completed the process. It did not say how many prevailed. G.M. said it would have about 4,500 dealers going forward, roughly 400 more than it had planned during bankruptcy and 1,500 fewer than it did a year ago. General Motors is putting back dealers as quick as they can, Mr. Fitzgerald said. G.M. has voluntarily restored all five of Mr. Fitzgeralds franchises; in arbitration with Chrysler he won one case in Florida and lost four in Maryland. Mr. Fitzgerald received Chryslers list of conditions, known as a letter of intent, for the Florida dealership in early June, but he is still trying to work out a deal. Mr. Palese said Chrysler sent Mr. Fitzgerald and the other winning dealers its usual and customary letter of intent, as required by the law setting up the arbitration process. He said some of the requirements in the letters were related to state franchise laws, which Chrysler believes the arbitrators rulings cannot supersede. Last week, Chrysler filed a lawsuit asking a federal judge to rule on whether Michigans franchise laws applied in the cases of two former dealers in the Detroit area who had won in arbitration.